Johnson's only flag chart to show the 'so called' Confederate States of America. 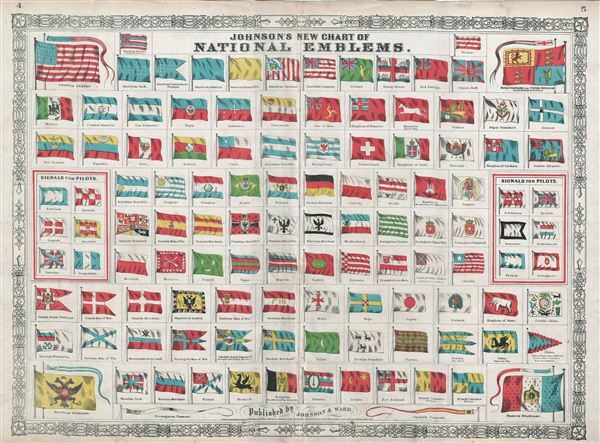 Johnson's New Chart of National Emblems. A beautiful first edition example of A. J. Johnson's highly decorative 1864 chart of the world's flags and national emblems. Johnson first introduced this chart in 1863 edition of his atlas. Though common in European, particularly English atlases, Johnson was the first American mapmaker to draw a national emblems or flag chart. Such charts were practical in port cities like New York, Boston, and London where military and merchant ships from around the world would often dock. Though initially a Richmond firm, Johnson & co. was quick to recognize the tide of war and smartly relocated business to New York City in 1861. Nonetheless, Johnson incorporates the 'so called' flag of the Confederate States of American in the lower right quadrant. Subsequent examples of this chart delete the Confederate flag. Features the fretwork style border common to Johnson's atlas work from 1864 to 1869. Very good. Some wear and verso repair along original centerfold. Blank on verso. Minor overall toning.